As soon as Ellen March saw the house she wanted to buy it. It was her dream home. Even the rumours that it was haunted didn’t discourage her. The dream home was to be the setting for a whole new happiness… until the dream turned into a nightmare. The shadow of a woman in the bedroom… the weird white cat… the vicious gossip… was it her imagination, some hideous joke? Or had the old witch returned from the dead to take possession of the house and of Ellen herself? First British edition published 1975 by Souvenir Press Ltd. This edition published 1977 by Pan Books Ltd. Since the death of her sister nearly ten years ago, Ellen and her daughter Penny have been living with Ellen’s widowed brother-in-law Jack and his son Phil. But teenager Penny is now flying the nest and Jack is starting a new job somewhere far, far away so Ellen needs to find a home of her own too. Enter real estate agent Rose, who tells Ellen of a property new to the market – a cottage built in 1720, set in thirty acres of woodland right on the edge of the Blue Ridge mountains, currently owned by irascible loner Ed Salling, who recently inherited it from his aunt and who is ready to sell at a reasonable price. The little house is old, isolated and falling apart but for Ellen it is love at first sight. Ed tries to warn her off, with stories of witches, ghosts and small town skulduggery, but nothing he says can dissuade her. So it’s not long before the title deeds are signed and Ellen moves in with her trusty companion – her beloved, very vocal Siamese cat Ishtar. She decided to read until the flames died down. The room couldn’t have been more peaceful. Her reading lamp shed a bright circle of light on the book without disturbing the soft gloom of the far corners, and the purring of Ishtar, curled up on the foot of the bed, blended with the sound of the rain. Involved with the adventures of Becky Sharp, Ellen read on. 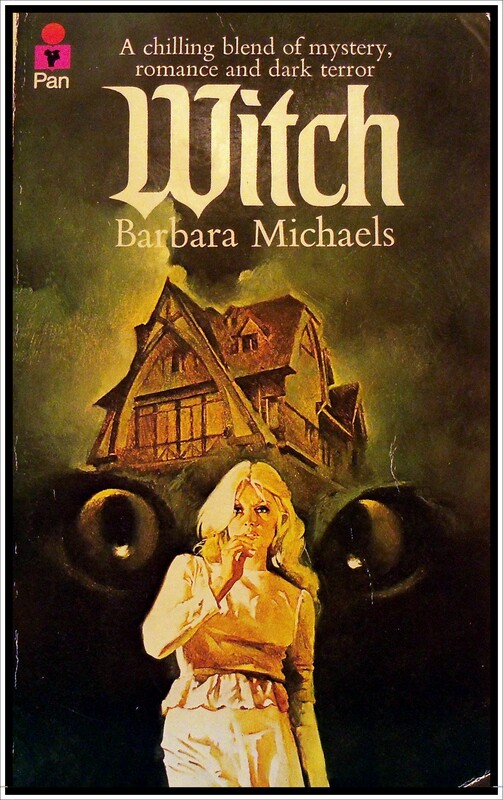 I reviewed Barbara Michael’s Greygallows a while back on this blog and out of the two, Witch worked far better for me. Set in the here and now (of the 1970’s) with an older, more engaging heroine, this was a fun book with lots of gothic goings on. In addition to the haunting shadow of a dead witch done wrong, there were ghostly cats, evil dogs, a (little) bit of possession and a neighbourhood full of weird witch burning villagers. Personally I would have preferred to have heard more from Mary – the gypsy witch haunting the cottage who was found hanged in the upstairs bedroom. In fact, the supernatural elements of this story were terrific but became increasingly overshadowed by other, more mundane storylines as the novel progressed. It was also obvious from the get-go who the bad guy was (those slavering, glittery-eyed hounds and that chronic cat allergy were a bit of a clue) and it was a little difficult to take him seriously as a villain since he spent a large portion of the novel in a fit of red-eyed, wheezing fear of felines. Nevertheless, ailurophobic anti-heroes aside, I had a lot of fun with this book. Four out of five stars. Adela Barron and her mother traveled to Florida to sell the house Papa Barron had lived in as a boy. The house was swarming with gypsies. When Adela tried to learn their customs, she was sharply reprimanded by her stern Aunt Cecile and by the gypsies themselves, including the handsome Django. Adela was warned never to go to the gypsy camp, but she did, and twice, attemps were made on her life. When she met Dr. Larry Norton she thought her problems were over. Then her mother disappeared. 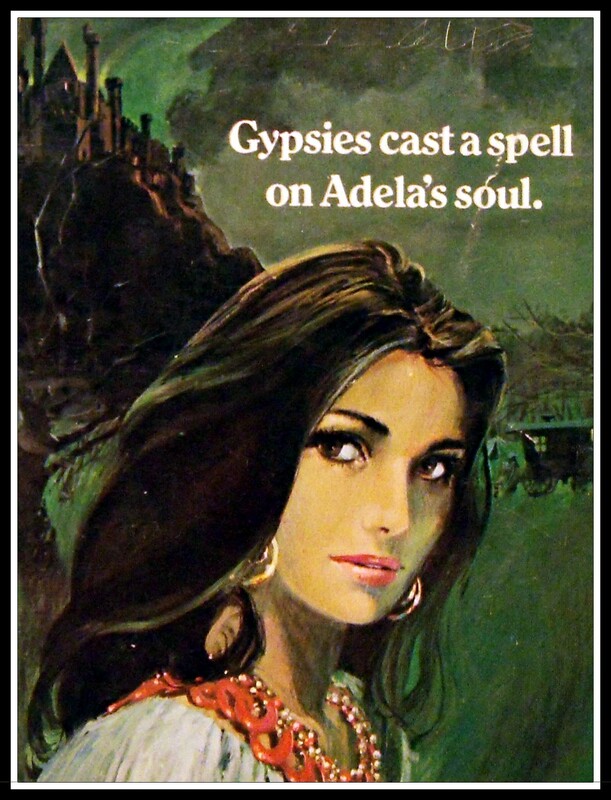 And Adela was sure the gypsies had kidnapped her. Written by Suzanne Somers. Published by Modern Promotions 1972. Suzanne Somers is one of the pseudonyms used by Dorothy Daniels, whose Strange Paradise novels I reviewed earlier this year. In Romany Curse, Adela accompanies her mother on a trip to her late father’s estate in Florida. Adela loves the house but her mother hates the place and is hoping to sell it off and move on as quickly as possible. Things do not go to plan – Adela’s mother is kidnapped by the local gypsies and Adela finds herself in ever increasing danger from their evil leader Hadari. It transpires Adela’s father was Hadari’s predecessor, so gypsy law – not to mention squatter’s rights – dictate the house and all of Papa Barron’s money, belongs to them. To seal the deal Adela is forced to marry Hadari. It all works out happily ever after when Adela and her mother are rescued by the handsome Dr Norton, the disgraced Hadari is forced into exile and the gypsies elect a new leader – Adela’s new best friend, the charming Django. Romany Curse is not very good and has very little to do with curses of any kind, let alone Romany ones. There is a bit of a story in there somewhere but stylistically there is nothing remotely gothic about its atmosphere or prose. Also, it is supposed to be set in the early 1800’s but the dialogue and overall characterisation is too modern to be convincing and actually gets confusing at times. On the plus side, Romany Curse is only about 100 pages long, so makes for an easy afternoon’s reading and I do like the artwork. The greenish cast and subject’s wide-eyed expression is somewhat reminiscent of those kitsch, plastic-framed matglo prints we used to win on the bingo stall at the funfair. Two out of five stars.